We know our customers. Here are a few things they love. If you are looking for a modern typography-filled "to have and 2 hold and to keep your beer cold koozies" this item can't be topped! 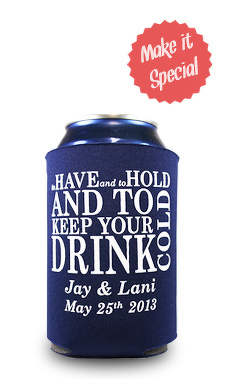 This "To Have And To Hold" can coolie features the phrase "to keep your drink cold" as well as the bride and groom names with a heart in the middle! Our custom koozie states "To Have And To Hold, And To Keep Your Beer Cold" along with the name and date of those in the ceremony. The perfect keepsake that keeps on giving! The big day is here - It's about time! Of course you've likely heard that a billion times already, so why not put it on your wedding koozie! This is a fabulous favor that will be fun for years to come. Celebrate your nuptials with our funny quoted wedding koozie that reads "Two Less Fish In The Sea"! It also features an image of fish about to be scooped up! What better way to commemorate tying the knot than with a Tying The Knot Koozie that features a heart in the rope! Enter any changes (name, date or layout in the comments section on the next page) to our stock design. We will make the changes and e-mail a final pdf proof before we go to print! Serving cold beverages on your big day? Our customized solo-cup style wedding koozies are sure to be a hit while keeping your guests' hands from freezing over. Our full color bottle wedding koozies give a fully custom look to your big day. These koozies feature a full wrapped print with any coloring you'd like! If you are looking to wrap your beer bottles in camo for your big day, our wedding camo personalized koozies are the best favor for you! The perfect wedding favor for those avid hunters and camo fans! Multiple types of camo wedding koozies to choose from and many printing options can help match your wedding theme.